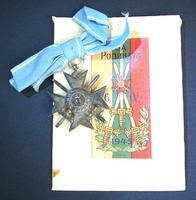 See scan - very good condition with ribbon and includes a WWII Victory type end of war packet case for this order. This is a nice and rare Bulgarian Royal WWII King Boris III issue of the Bravery Order for soldiers - 2nd Class in white metal. Nice militaria / military collector piece and one of the nice Bulgarian orders.